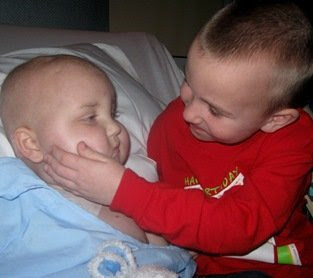 If you've been reading my blog, you know that over the last 6-7 months I've been following the Larson family through their journey of their little boy (Coleman) cancer HELL. He's had ups and downs and their story has been heartbreaking, inspiring and terrifying all in one for me. Little Coleman took a major turn for the worse on Christmas Day, and they had to airlift him to a hospital in Des Monies. He's home now, and the "TEAM" has met with hospice. I'm cutting out Peggy's last post from her CarePage, and the pictures (I hope she doesn't mind) because I know a lot of people haven't signed up to get into the updates ..... but I am hoping that you can say an extra prayer or two for this family and especially Coleman. It's an odd feeling to have become "attached" to a family that you've never met, but after reading Coleman's mom's updates for so long - the great times they've had as a family in the worst POSSIBLE conditions .... it's hard not to just love them to pieces for the strength that they have. Even going through all this, in Peggy's post below, she worries about thanking everyone for their kindness and generosity. She is AMAZING. I am keeping Coleman in my thoughts tonight...I hope you can do the same...he needs all the help he can get...no child should have to go through this. 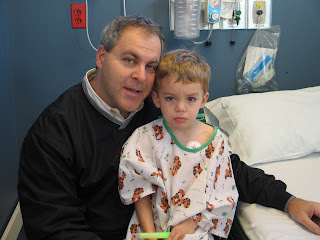 When I typed that update, I didn’t know what would happen next, but I fully intended that I would be updating the next day after the boys woke up- Scott and I were so excited for Christmas morning and watching them open everything…OR I at least thought I’d be able to update after our ER visit. In true Team Larson fashion though, a NEW plan unfolded, and this is the first I have been back to type it out. Our house still sits as it did Christmas morning. So I guess I’ll jump right in and start from Christmas morning- I know I'll probably leave a lot of details out, but here is the short version.Caden came down the stairs and was overwhelmed with the generosity of Santa! (Thanks to so many of you, and to so many secret Santas they had- GOD BLESS YOU!) He stood there in a daze, not knowing which way to turn…(kind of like his parents) He started ripping into things, while Scott and I did our best to put our happy faces on, knowing we were going to give him an hour or so and then be heading back to the ER with Coleman.Cade didn’t get through opening everything, but we had him choose two favorites and got him dressed to go to Aunt Sherri’s who met us at the ER. (THANK YOU SHERRI!) Coleman was pretty unresponsive as he didn’t have the best night and was still not talking or swallowing much. He was unable to talk and mostly slept. We were very worried. While we were in the ER, the doctors called DesMoines, and we were given the choice to either come home with him, or come there to have him looked at. We knew we couldn’t take him home again on our own without doing something, so Coleman and I got a helicopter ride to DesMoines while Scott drove to meet us. Oh how I wish Coleman would have known he was riding in a helicopter. 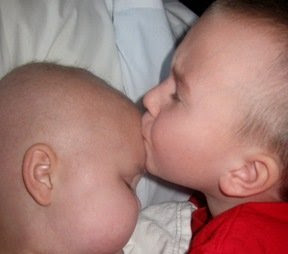 He would have LOVED telling Caden all about that. He slept the whole way. Once we landed in Des Moines, they got us a big room and kept Coleman comfortable. We can’t say enough about the kindness and compassion shown to us by the staff at Blank Children’s Hospital. Dr. Al-Zein and Dr. Woods are not just doctors but true angels. They were so wonderful to us- our nurses were the best as well. THANK YOU to everyone who took such great care of not just Coleman, but our family too. They gave Coleman a drug called Manatol (?) and after a day of sleeping, he did come to a little and we got a few more words out of him…even a dirty look or two, which I considered a gift- it was nice to see him responding. He picked up his hunger right where he left off after not eating anything by mouth for three days. Unfortunately it was short lived and he is back to the mostly sleeping and maybe a word here or there, and just a little food…but with all the of the pain meds, he’s pretty out of it. Even doped up on morphine though, bunny’s ribbon gets the twirling, same as always. We were inpatient until today. We came home today and met with a couple of awesome ladies from hospice, and we went over many options. For now, we are home. That may change, but we want to try it at least. Also Coleman is on a new oral chemo, because…. Well… “Team War-sin NEV-VA divs up.” We aren’t finished yet…we know in our hearts we need to keep praying and trusting in God’s love for Coleman and for us all. We have a new set of meds to keep Cman comfortable. That's our main goal, we DO NOT want him to be in pain, and so far he doesn’t seem to be. We pray that continues. We’ll take one day at a time and see how everything goes. The one thing, the only thing, that’s for certain right now- God is with us and giving us strength to keep going. Caden was able to come to the hospital and spend the past few nights with us in the room. It was a wonderful gift to all four be able to spend time together, even if it was in a hospital room. We’ve been having talks with Caden…I can’t begin to explain how difficult it is to answer his questions, hold him as he sobs, and says he needs to “help Coe-man fight harder.” It brings to mind the quote we have on Coleman’s home page here- "“There's nothing that can help you understand your beliefs more than trying to explain them to an inquisitive child.” -Frank A. ClarkHow true it is. The bond between Caden and Coleman is something we’ve seen all along, and that in itself is hard for us to comprehend at times, yet it’s there. I think we’ve given Caden as much as he can handle each time we talk, and we take his cue of when he needs to quit talking about it & go back to being the bouncy little boy he is. Small steps.I’m going to end there as I think I need to take this in small steps as well. I can't end with out saying...WOW- how blessed we are! The messages of support- what can I even begin to say? it’s overwhelming, and I find it hard to explain how touched we are. We thank you for the amazing support of our family, and for your prayers. There are so many people I’d like to personally thank, but I would be sitting here all night- please know how much it means to us.We’re hanging in there, and doing what we’ve always done…taking one day at a time, (sometimes one moment) and thanking GOD for all He’s continues to provide us in helping us make it through. Well to all my friends and family back home....I hate to say this but....our weather over the Christmas holiday and this weekend ROCKED. Saturday was in the 70's and today (Sunday) the car temperature registered 80 degrees. Ok something is wrong with this picture!!! On Christmas Eve my kids were outside playing hopscotch ... without jackets ...in their Crocs .... unreal!! Today, I saw my neighbor's kid playing outside without shoes on. This is just very ODD to me.....it does not feel like December 28th!!! Anyway, the previous post are some pictures from this past weekend. If you can believe it I didn't take a SINGLE picture from Christmas. I took some video with my awesome new FLIP video recorder I got for Christmas.....but NO pictures. Don't ask me why. I'm a bad Mom. This year everything (for me) was so chaotic, disorganized, down to the LAST second. Not usually like that for me. I'll post the Christmas video soon so you can see Zach opening his present that he wanted most .... a big Spike dinosaur with a remote control that moves and picks up bones. It's rather funny and he's so excited he loses his pants. Literally. Heehee. Anyway, it's late so I'll leave you with the pictures. I have to work tomorrow....Sam's off all week because Kayla and Ben are here ....we were actually getting worried - their flight got delayed in Atlanta (we don't normally have them connect, but the flights were so expensive this time, it was really our only option) and they kept delaying it, and delaying it....and Sam had actually booked the later flight so the kids didn't have to rush out of the house the day after Christmas morning. Hope everyone had a Merry, Merry Christmas!! We've been extremely busy with the holiday preparations ... getting excited for Kayla and Ben to arrive this week - right after Santa comes. 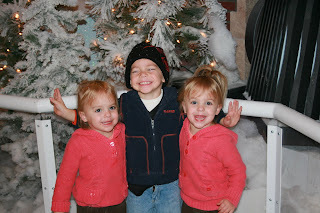 The kids are very excited, as you can imagine, for Santa and they have very specific requests. Zach wants (and this is exactly how he says it every time) a big Spike dinosaur with a remote control that moves and picks up bones. (It's that Fisher Price Spike Dinosaur). It's funny because it reminds us of The Christmas Story and Ralphie wanting the "Red Rider BB Gun!!" The girls both want baby cradles. And I can't tell you what Ben and Kayla are getting because they can read and might happen upon this post (sorry guys!!) We did not go as crazy as we did last year - they were WAY too overwhelmed last year with the number of presents, stuff to play with , etc. - and they were truly CRANKY by the end of the day - there was just SO MUCH. We kept it much smaller this year, so they should hopefully have a FUN time playing with the presents they get. I *finally* got my Christmas cards out....whew.....you all will probably be getting them late seeing as they just went out TODAY but......since they're handmade, and I made 100 of them .....maybe you can forgive me??? It just seems there is not enough time in the day!!!! Zach had a little school program (will post video later) last week that was really cute. We were lucky to get seats right by him, but he would NOT sing. He was the kid in the "funny home video" that was saying "hi mom", making faces, hands in his pants ..... the WHOLE time. LOL!!! He knew the songs too because he sang them at home!!! He looked so cute and silly. He's really really thriving in pre-school - his teacher is great and of course we have found a wonderful nanny that has helped make going to/from school much easier and more fun...so he's excited about going all the time. (Well, not so much about going - he's like his Momma and would prefer to start his day around 10:00 AM and stay in PJ's until then)...but once he gets there, he has a great time and his teacher said he's doing fantastic. He has, however, had ear infections that have lasted since September and have not gone away no matter what different anti-biotics they've tried, so today my poor, sweet, baby had to have tubes put in his ears. (Awww!!) I know, I know....it's a simple procedure that for an adult they can do in an "office" ... but when they put your first born under anesthesia ... it freaks Mom out. 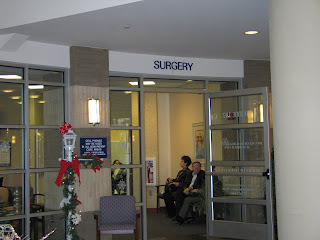 He was NOT too thrilled with the surgery center - the gave him some ....tranquillizers...... I guess you'd say, to calm him down beforehand....but they wore off quicker than they were ready for him so they had to give him a second dose. He kept saying I want to go home, I want to go home. He was still upset and it went from crying to laughing (at the same thing) .... and he was talking like a drunk person (which we laughed at a few times) but I did feel sorry for him (YES, I CRIED when they were getting ready to take him away!!) He woke up from the procedure crying (screaming?) and they brought us in there, I got in the bed and laid with him for awhile and he calmed down a little bit. He came home, had some juice and a snack and then took a nap - and when he woke up he didn't remember much from the day - we gave him new "batman" pajamas when we got home (he didn't know where those came from), he was surprised he took a nap (he never really does) and he didn't remember where our elf, Simon, was (I didn't tell you about Simon....did I? Remind me to come back to Simon.) But...when he woke up, he was feeling good and back to being a 4 year old. He wanted to write Santa a letter so he and Miss Rachel wrote Santa a letter and put it in the mailbox .... (the hundredth time he's told Santa he wants the big spike dinosaur with the remote control that moves and picks up bones). We took the kids out to dinner tonight (Red Robin, where else??) and then I took the girls for haircuts. I don't have pictures yet...but I'll tell you this, I got 5 inches (we measured after it was cut) chopped off their hair! They have these cute little pixie bobs ..... VERY cute. Addie's flips under, and Avery's flips up. Heeheee!!! We can still put barrettes, pull it back at the top, headbands, etc. ... but they look ADORABLE. Pictures .... tomorrow! Other than that....we're doing pretty good - just busy with work. Sam's had a lot going on at his company lately - they did a fundraiser for a toy drive, and between the fundraiser (they cooked for the employees and the employees paid for a "plate" of food for 5.00) and the donations they received in from vendors, etc. they had almost 10,000.00 to donate! They go out and purchase the toys, fill up an MDV truck (that's decorated of course) and go around to local military bases and drop of bags and bags and bags of toys. How nice is that! 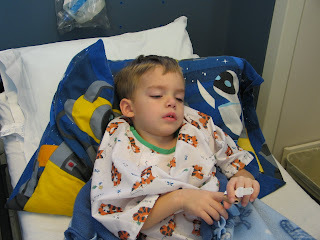 Well, I'll leave you with a couple of photos of Zach from his procedure today.....and a video that a couple of my friends have blogged. I think it really puts Christmas into perspective, it's short...and powerful. 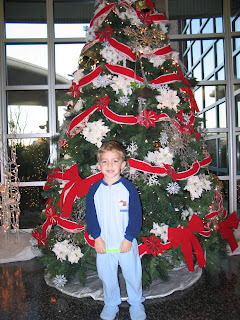 Zach standing outside the big Christmas tree at the Surgery center. He's happy now, and he knows he's going in for "tubes" but doesn't realize that means getting out of his jammies, getting connected to machines, etc. When Mommy was allowed to come back after they got Zach in his Tigger gown and took his blood pressure, etc. THANK GOD he asked for Daddy to go with him. I would have never guessed that he would have picked Daddy (sorry, Dad, no offense...but he's a MOMMA's boy, and when he's upset he always cries "I want my Momma") but he wanted his Dad this time! So Dad took him back and then I got to come later. He's a little bit drowsy here....notice the droopy eyes? Heehee. He wasn't happy, but he was making us laugh sometimes when he tried to talk. Daddy had to keep doing "magic" tricks to keep him laughing. Sorry everyone.....Five in our Hive is "going off the air" until further notice. I know my posts are kind of all over the place....I'm still behind posting Zach's last soccer game and his party where he got his (gasp!!) trophy for participation....but....what can I say!! 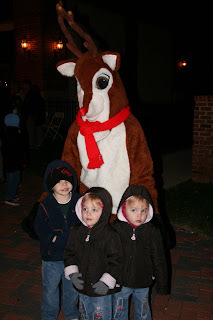 Last night we took the kids to this thing called Hollydazzle in Newport News ... it's a "once a year" event, apparently, in this little city center / town square area (there are shops, restaurants, etc). They were going to light up this huge Christmas tree and have fireworks over this really pretty pond (actually a very big pond) that's in the middle of this square around 9 - so we figured we would get there around 6:30ish to eat dinner at the Red Star Tavern (yum) and then walk around, see the fireworks and tree lighting and go home. They had lots of stuff for the kids - they were giving out tons of light sticks (these huge "foam noodle" looking things that had batteries with different "glow" settings so you could change the color, make them blink, random, etc. ), they were giving out glow stick necklaces, Frisbees, crafts, ornaments for the kids...all sorts of stuff. They also had a little carnival, food booths everywhere (funnel cakes, kettle corn, hot dogs, etc.) They had several bands/orchestras/carolers playing and people making kids balloon "things" everywhere. Other than the food - all of the extra stuff was free! Needless to say......it was PACKED. When we got there, we parked and pretty much walked over to the restaurant right away and were told it was a 2 1/2 hour wait. Um, yeah, our kids were DYING as it was (it was 7:00) - they're usually in bed between 7:30-8:00 so they've long had dinner by this time usually!! We had to walk around for about another half an hour to find cash to get food at one of the food vendors .... we stood in a huge line at a food booth - and the kids were FREEZING - lips quivering, goosebumps under their coats .... they were CRANKY because they were hungry .... and so we decided just to leave. This is now a little after 8 ... so we are looking for something decent close by - everything looked packed - where do we end up? You guessed it, the Golden Arches ..... not that the kids minded!!! We ate and then decided to see if we could find a parking spot close enough to watch the fireworks from the car. We actually found a spot close enough where we could walk back and then get right back to the car (most of the parking was in a parking garage) - so we all got out and walked back. 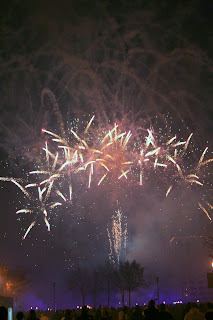 The fireworks started (after a lengthy speech from the mayor, lol, or it seemed lengthy in the cold anyway!!) and the kids FREAKED out. All three of them. They were all crying and just ..... freaking out. So.....we had to walk back to the car. 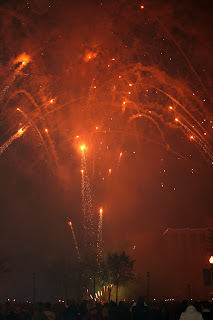 By the time we got far enough away, Zach enjoyed watching them, so he and I stood and watched for awhile....he even said "this was the best fireworks ever!" I was thinking - what about 10 minutes ago??? They obviously didn't like the noise - the girls did say they liked the colors. 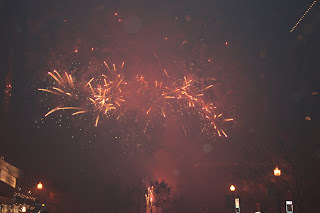 Anyway, here's some pictures from Hollydazzle and if you live in this area - I'd encourage you to go next year....there is TONS of stuff for the kids.....just don't plan on eating there!! FINALLY, I got the slideshow from previous post to work! Many of you have (kindly) inquired about our nanny situation ... and I wanted to let everyone know that we have *finally* found (and I hope I don't jinx us by saying this) our Nanny Poppins! Her name is Rachel (good omen??) and she's live out - been with us about a month now - she lives really close to us and the kids LOVE her! She does all kinds of fun things with them, like hide-and-seek and really cool crafts every day (like painting and cutting things and gluing and making macaroni necklaces - oh and they all made really awesome turkeys for Thanksgiving...I'm saving those for their "baby books!!"!!) She'll just take them over to Michael's, pick out a craft and that's what they'll do for the day. She came to Zach's soccer game (which he thought was pretty cool) and has taken the kids to her house several times to see her dog's new puppies - which they have positively raved about (and no, were not getting one, heehee!) Our house is spotless at the end of the day, the kids laundry is ALL done, they've had a bath, and best of all she does not get flustered when the kids have a meltdown. She's a pro at diversion and I've never heard her have to raise her voice....even when they're acting up (which as you know 3 and 4 year olds tend to do....often!!!) Zach is really into the "Goldilocks and 3 bears story" right now. He likes when I tell it to him - not read it from the book - and "add" things (like pizza instead of porridge, and Goldilocks stays instead of jumping out the window to play monster trucks with baby bear...lol). The other night he asked me to tell him a story about Mommy, Daddy, Zach, Addie, Avery and Miss Rachel walking through the forest and coming to the 3 bears house. Too funny. He said "I miss Miss Rachel". Ok you KNOW he likes her!!! The girls call her Miss Racho. Anyway, wanted to give you all a status update. 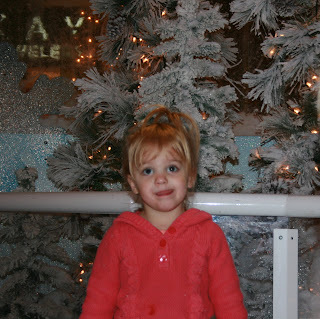 Please keep your fingers crossed and pray HARD that she continues to like our family as much as we like her. She's done an excellent (BEYOND excellent) job and we are continuing to tell her that....so I hope she is feeling the rewards of taking care of the kids. Her goal is to open her own daycare someday, so this is definitely "hands on practice!!" The weather outside is ... frightful? Um, not really. Yeah, I know my family and friends back home are dealing with cold and snow ... but here are some pictures of the kids from our weekend, which as you can see.........was pretty nice weatherwise (60ish?) I have to say, I really love being so close to the ocean, but I DO miss the snow once in awhile! I'm trying a new slide show program....hope it works. If not, I'll send out the photos again tomorrow on my handy Snapfish! !